Chinese sellers often look to Canada as way to access the broader North American market. But, if the U.S.-China relationship remains fraught or worsens, Chinese sellers and investors, who are averse to conflict, might also turn away from Canada, she said. There is also the concern that Canada will ultimately pick sides with its traditional ally, the U.S. “In Canada we hope that these two economic global superpowers will find a way to resolve their problems,” Ms. Wang said. “And that would probably in the long run be a good solution for us, and also for the rest of the trading countries that are so dependent on the global trading network.” Recently, the grass has been holding its own in the turf war. In some areas — like agricultural products — it has even benefitted from the superpowers’ struggle. In others, such as steel exports, the grass is taking a beating. And it now appears that because of the arrest by Canada of Huawei’s CFO, and the Canadian government’s handling of the SNC Lavalin file, the short period of time when Canadian agricultural exporters enjoyed an advantage over their U.S. competitors is coming to an end. Overall, the United States remains Canada’s major export market by far. But in 2018, as the U.S. imposed sweeping tariffs on Chinese goods, as well as broader tariffs on steel and aluminum, the dollar value of Canada’s exports to China have been on the rise. The increases, though small in the aggregate, ballooned in some instances. For example, the value of wheat exports to China nearly tripled in 2018 compared with the year before. The value of steel and iron exports to the U.S. from Canada held steady compared with 2017 after U.S. President Trump imposed tariffs on those products in June. However, volumes were down because steel prices rose, an effect attributed to the tariffs. So what does this all mean for Canada’s trade going forward with the two superpowers? Ottawa economist Dan Ciuriak, a fellow in residence with the C.D. Howe Institute and a distinguished fellow with the Asia Pacific Foundation of Canada, said national relations don’t usually affect trade because it is primarily business-to-business. An exception is when “governments deliberately restrict transactions.” For that reason, he said bilateral tariffs between China and the U.S. have likely boosted Canada-China business. “We calculate a boost of about C$8.3 billion in bilateral trade, with over a C$1.5 billion boost in Canadian exports to China and a C$6.8 billion increase in Canada’s imports from China,” Mr. Ciuriak said by email. One the first things to keep in mind is that economics “is not an exact science,” noted Pedro Antunes, Chief Economist, The Conference Board of Canada. An implication for Canada, though, is that while the U.S. remains Canada’s biggest trading partner, “China is our biggest growth opportunity,” Mr. Antunes said. The constant dollar value of exports from Canada to China increased 12.6 per cent in 2017 compared with 2016. But that followed four years of little growth — 8.3 per cent over four years — and even a slight drop in 2014. From 2008 to 2013, Chinese exports to Canada were growing at a double-digit rate. Ms. Wang said the economies of China and Canada are complimentary, in that they don’t sell too many competing products. And as China’s middle class grows, it creates more opportunities for Canada. “Sometimes the bigger problem is whether Canada has the capacity to really supply that market. It’s huge,” Ms. Wang said. Canadian exports from the agricultural, forestry, fishing, and hunting industries to China increased 23.6 per cent in the first 11 months of 2018 compared with the same period in 2017 (from $5.22 billion to $6.45 billion). Canadian wheat exports to China nearly tripled in that same time frame, to $425.6 million from $150.2 million. Soybean exports to China also increased steeply, by 62.3 per cent, to $1.35 billion from $829 million. The increases in wheat and soybean volumes to China didn’t appear to be at the expense of Canadian exports to the U.S., though. Exports of both commodities from Canada to the U.S. increased — 18.5 per cent in the case of wheat, and 3.4 per cent for soybeans. 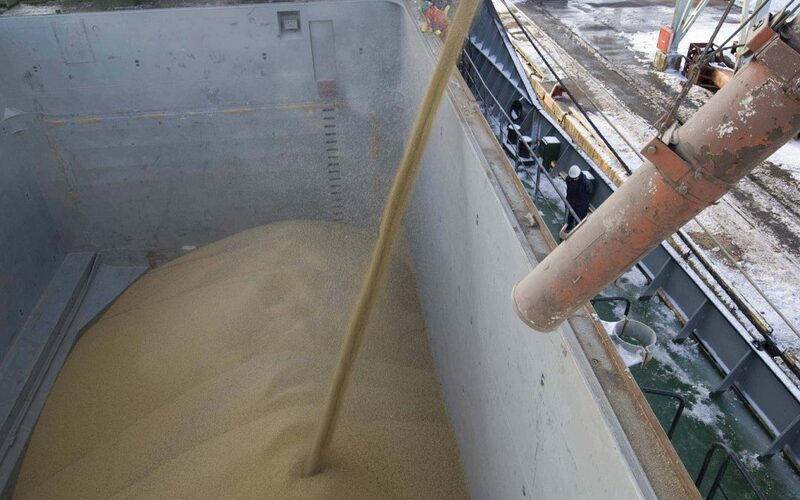 Canada’s exports of soybeans to China surged in January 2019, Bloomberg News reported. The 1.23 million tonnes was quadruple the amount of the previous January. Meanwhile U.S. soybean exports to China collapsed from 5.8 million tonnes in January 2018 to 136,000 tonnes this January. Ms. Wang said a “big factor” in Canada’s increased soybean exports to China is the 25 per cent tariff that China applied to U.S. soybeans in retaliation for its sweeping tariffs on a variety of goods. But she cautioned that the boost might be short-lived, should China drop its tariff in order to “sweeten pot” in its trade negotiations with the U.S.
Mr. Ciuriak also noted that Brazil was the major beneficiary of the loss of U.S. soybean exports to China. “Commodity-specific factors would determine which countries pick up the slack in exports to China deterred by China’s tariffs on U.S. products,” he said. Canada’s overall trade volumes haven’t been particularly good in recent years, Mr. Antunes said. Any recent growth has been in natural resources, as opposed to value-added goods. In China, for example, Canada has done well in fish, food, and tourism, but not much in other areas. The dollar value of steel exports decreased about 32 per cent from May 2018 to June 2018. However since then, year to year from 2017 to 2018, the value of the exports increased each month from July 2018 to October 2018, although it did decline in November 2018 relative to November 2017. Meg Gingrich, a researcher with the United Steelworkers Union of Canada, noted that the dollar value is misleading because it doesn’t take into account price fluctuations. According to the Steel Benchmarker website, the price of hot-rolled band steel, or HBR, was $682 a tonne in late November 2017 but $864 a tonne in late November 2018, a 26.7 per cent change. “Although the value hasn’t changed as much, the actual volume of exports has gone down by about 20 per cent,” Ms. Gingrich explained. Steel prices spiked in July 2018 just as the tariffs started taking effect. HBR reached $1,006 per tonne on July 18, but had dropped to $773 in February 2019, lower than its price in February 2018. Among the looming threats is the prospect of massive layoffs to the 15,000 to 20,000 union members working at Canadian steel mills. “We have seen some layoffs,” Ms. Gingrich said. “But so far, the main impacts have been the threat of layoffs and the uncertainty that all this is causing.” While she didn’t wish to speak on behalf of Canadian steel producers, Ms. Gingrich said some plants are faring better than others. One that is having trouble is Algoma’s Tenaris Tubes plant in Sault Ste. Marie, Ont., because it is more heavily dependent on exports to the U.S.
Canadian Sailings contacted the Canadian Steel Producers Association, but did not receive responses to its questions by deadline. “They’re still dealing with the same things that get passed down to our members, which is the uncertainty, having trouble expanding or making plans to expand because they don’t know how long the tariffs will remain in place,” Ms. Gingrich said. Mr. Ciuriak, however, offered a more optimistic outlook for Canadian steel, despite the tariffs. “It is possible for Canadian suppliers to fill some of the market share that third-party exporters to the United States have lost, even over the tariffs that Canadian producers now face in the U.S., because transportation costs and established supplier relationships make Canada the preferred choice for some U.S. buyers,” he said. Did China use Canada as a back door? One impetus for President Trump extending the steel tariffs to Canada is that he saw it as a backdoor for China to dump steel into the U.S. “I think there is a risk of some pass through, there’s no question,” Mr. Stephens said. He pointed out that after Mr. Trump imposed the tariffs, Canada “tightened up its procedures to ensure that Canada would not be used as a backdoor.” Those measures included steep anti-dumping and countervailing duties as well as more stringent tracking rules “to ensure that Chinese product imported into Canada does not find its way into the United States, circumventing the U.S. tariff on Chinese imports,” Mr. Ciuriak pointed out. The biggest problem is China’s over-production of steel. “They produce considerably more than what they consume and then that causes a glut on the world market that drives down prices and so on,” Ms. Gingrich said. Mr. Stephens said it looks like the U.S. is preparing to lift the tariffs, which he said were also used as leverage in renegotiations for a renewal of NAFTA, which have since concluded, and morphed into USMCA. Mr. Antunes is hopeful that once the final agreement is signed that Canada can use it to put pressure on the U.S. on the steel and aluminum files, as well as on that perennial bugaboo, softwood lumber. “The problem is that all these things take time and in the interim we see our industries under pressure,” Mr. Antunes said. Meanwhile, Mr. Stephens expects that Mr. Trump will make a trade deal with China, although he is doubtful that the U.S. President will get all the concessions he would like. “In fact, my suspicion is that at the end of the day, they’ll get the best that they can, they’ll declare victory, and probably the Chinese will not have done most of what people think should be done,” he said. That’s because it would be “a very big lift” for China to restructure its economy and, for example, stop subsidizing its state-owned enterprises. The tariffs are just going to hurt U.S. competitiveness by hampering the purchasing power of the U.S. consumer, Mr. Antunes said. That is a big concern because of the outsize force U.S. consumers exert on global demand. “The U.S. Administration is essentially trying to protect some economic sectors using, I would suggest, measures that are really not in line with much of what we’ve seen in the WTO and much of economic thinking,” Mr. Antunes said. While Mr. Antunes accused the U.S. of being overly protectionist and failing to heed economic theory, he nevertheless said the U.S. has legitimate concerns about China’s entry into the World Trade Organization and how it violates WTO rules about market access and restraints on private enterprise. “I don’t mean to beat up on the U.S. per se because I do think they have some justification in pushing China,” Mr. Antunes said. Ms. Gingrich noted one strategy for Canada to deal with its deteriorating relationship with the U.S. is to increase its trade with China. That’s something the steelworkers don’t support because bilateral trade agreements with the Chinese tend to be one-sided in favour of China. The union would instead prefer to implement measures, including border adjustments, to compel China to meet higher environmental and labour standards in its steel production. Not surprisingly, the union also favours promoting Canadian steel in domestic infrastructure projects as well as an end to the tariffs. In fact, she noted that the Trump Administration has granted more tariff exemptions to Chinese companies than to Canadian companies. (A study by researchers at George Mason University found that 39 per cent of requests to waive tariffs on steel imported from China were approved compared with 27 per cent on imports from Canada.) “If these measures are going to be in place for much longer, we want them to apply to the bad actors, and not go after Canada and Canadian-made steel, because we’re not the problem,” Ms. Gingrich said.